Giant sequoia trees may be the main attraction in the Grant Grove section of Kings Canyon National Park, but the area contains several granite peaks, and the highest point - 8,209 foot Big Baldy - may be reached by a pleasant, 2.2 mile trail through scattered pine woodland, starting from the Generals Highway (CA 198). The path is relatively little used but easy to follow and not too steep, its 650 feet of elevation gain confined to several short climbs near the start. 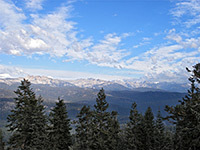 The summit and various viewpoints along the way allow fine views over a large section of the Sierra Nevada mountains, from chaparral-covered lowlands in the west to the snow capped peaks of the Great Western Divide in the east. Big Baldy Trail topographic map. 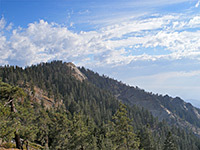 Panorama from the summit of Big Baldy. The signposted parking area for the hike is a small layby next to the main road, just outside the eastern national park boundary, a point 6.6 miles from the CA 180 junction and 22 miles from Giant Forest Village in Sequoia National Park. 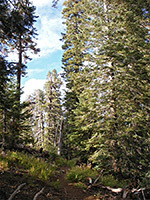 The closest official campsite is 5 miles south at Stony Creek, though free camping is possible anywhere in the surrounding national forest land (part of Giant Sequoia National Monument), and the nearest suitable places are just a couple of minutes drive away along the gravel track to Big Meadows, beginning 1,000 feet from the trailhead, on the opposite side of the highway. The path to the summit follows Big Baldy Ridge due south, starting by crossing a belt of pine woodland and climbing a little to the west side of the ridge, where the view opens out to a nice vista of Redwood Canyon, 2,000 feet below. The path traverses a flattish area of granite boulders and terraces then re-enters the trees, though much of the forest is quite light and airy, just with a few darker patches where the trees grow close together. The north-facing sides of many of the pine trunks bear a covering of thick green moss, and the forest seems generally healthy and well-watered, despite many broken trees reflecting the harsh, windy conditions that sometimes prevail. 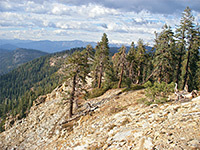 A second more open area of granite is reached after a mile, from where Big Baldy first comes properly into view, rising above the woodland to the south. The remainder of the route has a gentle descent, a longer, level stretch through more trees, and finally a short ascent to the summit. 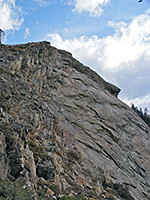 This drops off very steeply on the west side but has a more rounded slope on the east - a profile characteristic of glacier-sheared peaks like the much larger Half Dome and Clouds Rest in Yosemite National Park. The full extent of Redwood Canyon is now in view, enveloped by an unbroken blanket of pine trees; the tall sequoia that also grow here are of course indistinguishable at this distance. 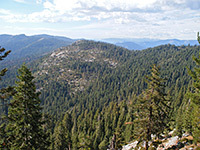 Although the eastern half of the panorama from the summit is partly blocked by a line of treetops, the western half is unobscured, from the Great Western Divide across Kings Canyon to Redwood Mountain and the Sierra Nevada foothills bordering the Central Valley - see panorama.